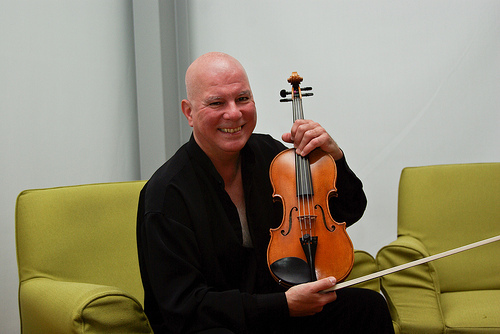 Elmar Oliveira is a famous contemporary violinist from the United States. He recorded great achievements in over 50 years of his violin career, which includes winning top musical awards, being nominated for a Grammy Award and serving on the juries of some of world’s prestigious violin competitions. Born from a family of Portuguese immigrants, Elmar Oliveira began his violin studies at the age of nine, with his brother John. He later furthered his studies under Ariana Bronne, a famous violinist in 1950s, and teacher to hundreds of violinists today, and Raphael Bronstein at the Hartt College of Music and Manhattan School of Music. The two colleges were also where Oliveira received his honorary doctorate from. Elmar Oliveira also has a glorious list of works which showcased some of the greatest pieces from the Baroque period to the present. Recording companies which has worked with Oliveira includes Artek, Angel, SONY MAsterworks, Vox, Delos, IMP, Naxos, Ondine and Melodiya. While Elmar Oliveira has won numerous contests and performed internationally with world renowned orchestras, one achievement that is unique to him is his nomination to the Grammy Awards, for his CD of the Barber Concerto with Leonard Slatkin and the Saint Louis Symphony. He also has a best-selling recording under his belt, the Rautavaara Violin Concerto with the Helsinki Philharmonic. It went on to win a Cannes Classical Award, and got listed on Gramophone’s “Editor’s Choice” and other “Best Recordings” lists around the world. In 1978, Elmar Oliveira won the Gold Medal at Moscow’s Tchaikovsky International Competition. Till today, he is the first and only American violinist to win this prestigious award. Oliveira is the first violinist to receive the Avery Fisher Prize, one of the most significant awards for American instrumentalists, and the winner of the Naumberg International Competition and the G.B. Dealy Competition. Elmar Oliveira travelled extensively for live performances with many world’s prestigious orchestras, including Boston Symphony, Buffalo Philharmonic, Chicago Symphony, Cleveland Orchestra, Colorado Symphony, Detroit Symphony, Helsinki Philharmonic, Leipzig Gewandhaus, London Philharmonic, Los Angeles Philharmonic, New York Philharmonic, Philadelphia Orchestra, Rochester Philharmonic, Saint Louis Symphony, San Francisco Symphony, Seattle Symphony, and the Zurich Tonhalle, to name a few. Elmar Oliveira is also a recipient of the Order of Santiago, Portugal’s highest civilian honor. He is currently a Distinguished Artist in Residence at the Lynn University Conservatory of Music in Boca Raton, Florida. “Meditation from Thais by Massenet” by Elmar Oliveira on the violin. More Elmar Oliveria’s Violin Music here. Below are some of the violin music recordings by Mr Elmar Oliveira. To listen to a short music sample of the whole music set, click on the link. Elmar Oliveira was known for purchasing the antique violin, the 1697 Molitor Stradivarius in 1989 at auction house Christie’s. He played on the million dollar Strad until he had the 1729/30 “Stretton” Guarnerius which he currently performs with.